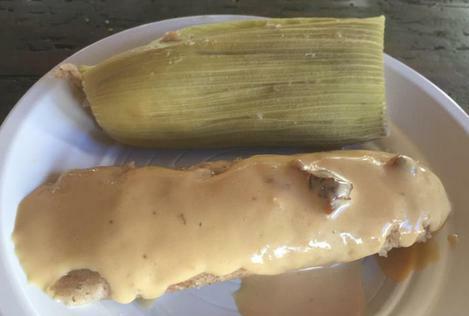 Those tamales might be number one for a long time. They took about an hour to steam and we learned to put a penny in the bottom of the pan, and when the steamer goes dry, the penny starts banging around. The class started with Bob chopping the raisins and a cup of sugar poured into a melting hot skillet. Nothing gets a class motivated more than the smell of molten sugar and butter. Needless to say, I was hungry from the second the class started. The rum and cinnamon joined in the bubbling, along with slices of fresh pineapple, and the entire concoction caramelized in front of our very eyes. We then started on the masa for the tamales, mixing in butter and massive amounts of slivered almonds. Dessert was basically Sweet Tamales, a real treat. Fresh corn hunks were smeared with thick masa, layered with slices of caramelized pineapple with raisin bits and steamed for one hour. The Chile Rellenos were filled with a medley of veggies from the Patzcuaro Market, at Plaza Chica: onions, zucchini, fresh corn, chiles, seasonings and cheese. The rellenos were covered with a red, bell pepper sauce we made and were delicious. The Stacked Chicken Enchiladas were three crisp tortillas, stacked and layered with a different sauce, and layers of chicken and cheeses. 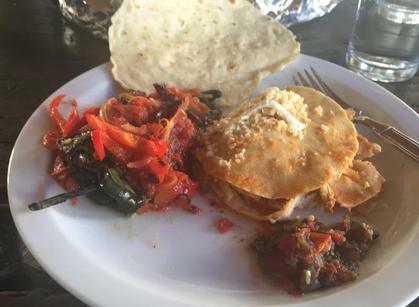 We served the 2 dishes to ourselves as we shoveled on the Fiery Salsa, a simple masterpiece of tomatoes, onions and chiles, while diving into the food with our very own Flour Tortillas. 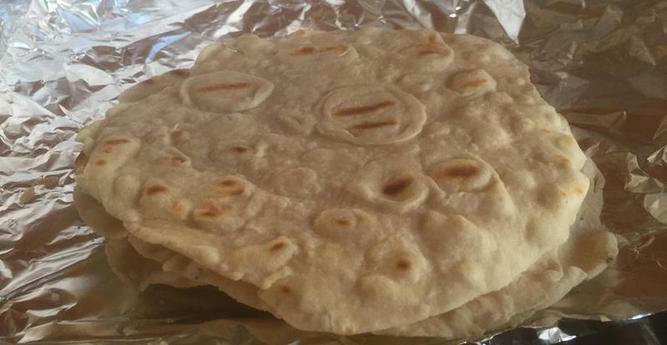 The thing about real, homemade, flour tortillas is their ease and speed in preparation. AND, worth the few minutes preparation time. After only a handful of lessons, Patzcuaro’s Cooking Class is already a tradition. Every month or so, about 8 folks gather around an oversize kitchen prep-table and prepare a full-course meal, all under the eye of Master Chef Tim McGrath. He has worked in restaurants around the world and knows to clean as you cook. 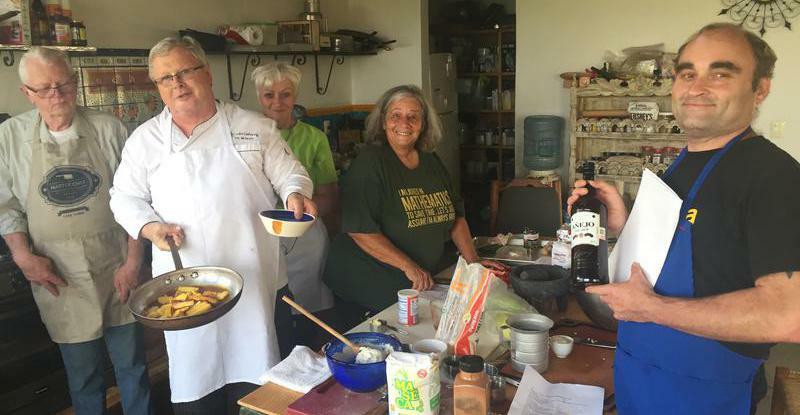 McGrath’s previous cooking classes in Patzcuaro have made a Southwestern meal, Pizza from scratch, a complete Thai menu and a Shrimp Pot Pie, with Bread pudding. Yesterday, the class prepared a traditional Mexican meal of five different recipes, including #2-Chile Rellenos, #3-Stacked Chicken Enchiladas, with #4- Flour Tortillas and #5- Fiery Salsa. Coming in at Number 1, was dessert, Caramelized Pineapple Tamales. We got a handout with all the recipes on separate sheets. All ingredients were locally acquired, and changed with the seasons. Everything was extremely organized, with everything laid out and utensils handy. Some of Tim’s classes meet at the Patzcuaro Market, where they choose and purchase the ingredients, then return to the kitchen and cook. For reservations and more info, call Tim at 434-139-1774. Buen Provecho, David P.S. I think the best part of the class is eating what we prepared and cooked.